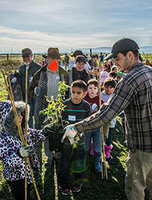 Point Blue’s watershed restoration and education program, Students and Teachers Restoring A Watershed (STRAW)facilitates K-12 students in implementation of professionally designed restoration work on streams and wetlands in the San Francisco Bay Area. Through restoring watersheds, STRAW restores our connections with the land, with each other, and with the sense of hope for a more resilient and responsible world downstream. STRAW's watershed science education activities offer an integrated place-based learning experience for students to work together, connect to their local watershed, and be empowered by their actions. Each year, approximately 4,000 students participate in 60 restoration work days, planting 5,500 native plants. This is a full time Monday- Friday (occasional weekends required) field work position spending 4-5 full physically demanding days per week outdoors (all weather conditions). Required travel and overnight stays for up to a week to STRAW field sites throughout South Bay Area and the Sierra Nevada (dependent on project funds). Train, supervise and lead students and adults during restoration and maintenance work days. Teach concepts of restoration and climate change science through inquiry-based learning to K-12 students through in-class and outdoor lessons. Assist staff with workday preparations (site visits, plant pickup, and tool preparation). Learn and apply new communication techniques to create effective collaborations. Set-up, operate and troubleshoot various temporary irrigation systems and utilize Best Management Practices for restoration and weed control. Fulfill the role of an Assistant Field Leader for several restoration sites to track site needs and clearly and concisely record and communicate about site progress. Assist with coordination and implementation of STRAW teacher training events. The opportunity to be involved in various education workshops, lessons, and events. Create a final capstone project that celebrates learning throughout the STRAW Intern Volunteer program. Compensation: The Intern Volunteer position receives a monthly stipend of $850/month (gross) to offset living expenses, plus shared housing in Petaluma, CA. Interns are required to accept shared housing proximate to Point Blue’s Petaluma Headquarters (housing and related costs to be covered by Point Blue). Relevant education or field work experience. Enthusiasm and experience for ecological restoration work. Enthusiasm and experience for teaching K-12 students and other public audiences. Openness to learn and share knowledge and skills. A strong sense of self awareness and the willingness to engage in reflective practice. Strengths in troubleshooting field-based challenges. Ability to work respectfully on private and public property. Ability to thrive in both a team setting and individually/live in shared housing cooperatively. Ability to lift and carry 40 pounds and complete strenuous physical tasks. Have a valid driver’s license with at least 5 years of driving experience. Ability and willingness to drive Point Blue owned work trucks, tow trailers, and drive off-road/4WD. Other helpful skills include Spanish language proficiency, California native plant knowledge, and the ability to drive and haul trailers. Best Management Practices in urban and rural community-based, climate-smart restoration. Education theory and practices, specifically inquiry-based learning. Methods of plant and wildlife monitoring. Current trends in California science standards and practices. Effective collaboration and team-building techniques. Educating K-12 students in and out of the classroom. Communication techniques to create effective collaborations. To Apply: By August 7, 2018, please submit an online application including your resume here: https://goo.gl/CpNS3c If you have difficulties with this form or would like a printed copy of this application, contact Emily Allen (eallen@pointblue.org) or (707) 781-2555 ext. 360.